I am delighted to announce that I have been asked to create a memorial to the Guinea Pig Club. The Guinea Pig Club, was established in 1941, it was a social club and mutual support network for British and allied aircrew injured during World War II. Its membership was made up of patients of Archibald MacIndoe at Queen Victoria Hospital, East Grinstead, Sussex, who had undergone experimental reconstructive plastic surgery, generally after receiving burns injuries in aircraft. The members were aircrew patients in the hospital and the surgeons and anaesthetists who treated them. By the end of the war the club had 649 members. The club remained active after the end of the war, and its annual reunion meetings continued until 2007. 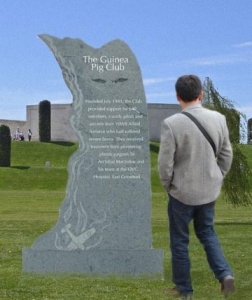 The memorial will be carved in green slate and its basic form is in the shape of a Spitfire wing. On one side, a plane crashes, representing the brutal nature of how the Guinea Pig Club members would have received their injuries. The spiraling vapour trail from the plane forms the outline of the face of Sir Archibald MacIndoe, the pioneering plastic surgeon who’s team did so much to reconstruct not only the hands and faces of the victims but also their lives. The memorial will stand around 2m tall and will be located at the National Memorial Arboretum in Staffordshire.